Doug Maxwell and Bill Clarke belong to a local musician’s group which raised $500.00. They challenged the Fisherville Lions Club to match the money they raised for camp activities through the Fresh Air Fund. The Fisherville Lions club was up for the challenge. 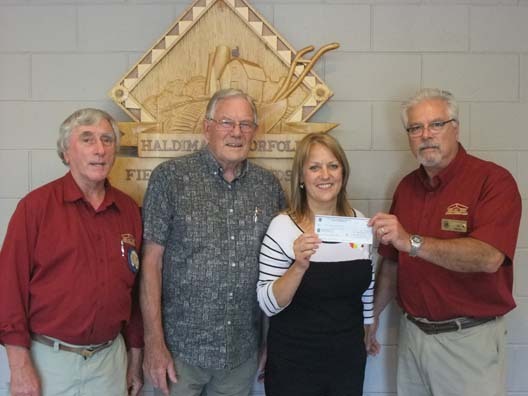 Seen in the photo from left to right is Doug Maxwell, musician and Lions member, Brenda Hunt, from the Children’s Aid Society of Haldimand and Norfolk, Bill Clarke, musician and Lions member and Jim Swing, President of the Fisherville Lions Club presenting a cheque of $2,200.00 to the Fresh Air Fund.